How Does A Lever Chain Hoist Work? If you frequently need to raise and lower heavy loads around your garage or job site, then most likely you need some kind of hoist. 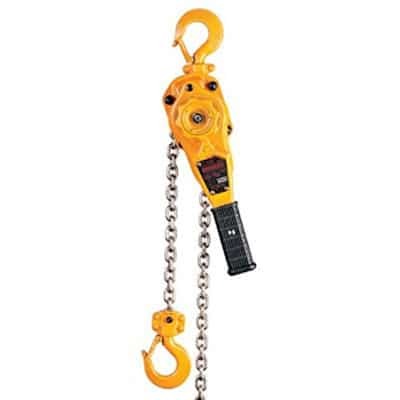 If your loads are not too heavy, and if hoist portability and simplicity is important to you, then a lever chain hoist may be just what you need. But with so many models available, which is the right one for you? Have no fear – we’ve gone over latest lever hoists on the market and chose the best at a variety of lifting capacities. Quarter-ton lever hoists are the light duty items in our round-up. While lifting 500 pounds of payload is no mean feat, these lever hoists are best suited for jobs that need portability more than brute strength. 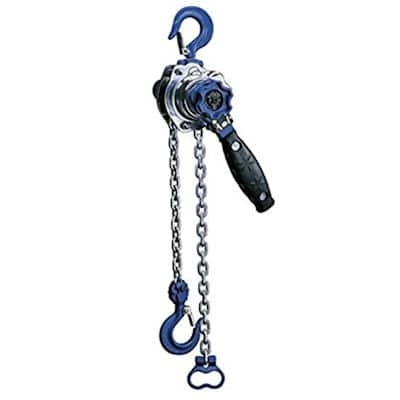 Portability and low price are two of the characteristics that make the Roughneck Manual Lever Chain Hoist so popular. This handy little lift only weighs about 5 pounds, and comes with a convenient storage bag, making it the perfect addition to any pickup truck or tool chest. But don’t let the size fool you – this little lever hoist is built from tough steel components. And the compact design allows it to work well in narrow tight places. Most of the online reviews for the Roughneck are positive, with users praising the portability and ease of use. People mentioned lifting everything from trailer hitches to pumps and motors with this rugged little hoist. However, a few users warned against overloading it, which is sound advice no matter which chain lever hoist you choose. 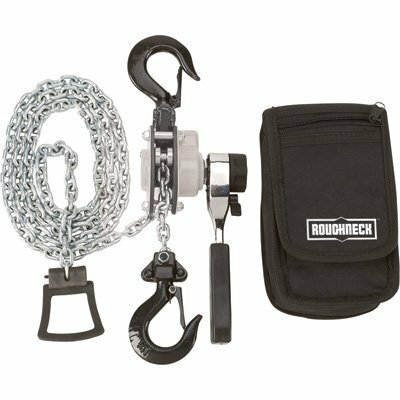 Given the compact yet rugged design, the Roughneck Manual Lever Chain Hoist is a terrific addition to any shop or garage. And given the low price there is no reason not to buy several to keep under the seat or in the trunk of your vehicle. 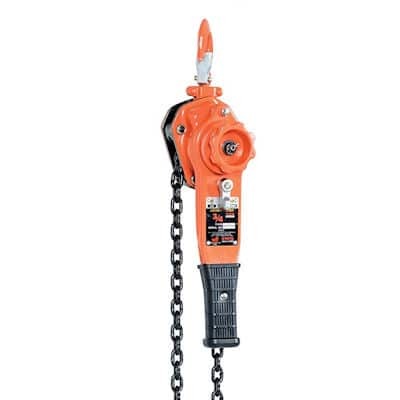 Like the Roughneck, the CM 602 Series Mini Ratchet Lever Chain Hoist is another tough competitor in a small package. This rugged little mini-hoist also weighs in at just five pounds, but manages to lift a 550-pound load. 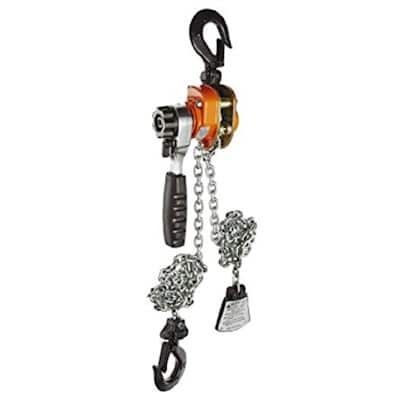 It features a hardened plated alloy-steel load chain, a Weston-style load break (to keep your load from slipping back), and forged hooks for extra strength. And the rubber grip on the handle make it easier and more comfortable to use. Online reviews of the CM 602 are overwhelmingly positive, with owners frequently commenting on the lever hoist’s portability and suitability for work in tight spaces. More than a few also commented on the construction quality of this great little hoist. 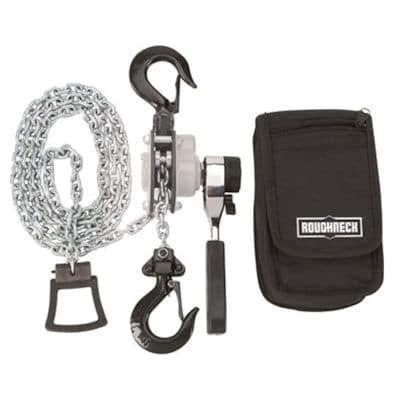 The CM 602 Lever Chain Hoist does cost a little more than the Roughneck, which is why it ended up at our #2 pick. However, it does deliver 10% more lifting capacity for that extra price, and also seems to be built a little stronger. So if a mini-hoist is on your shortlist of tools, the CM 602 is worth a look. 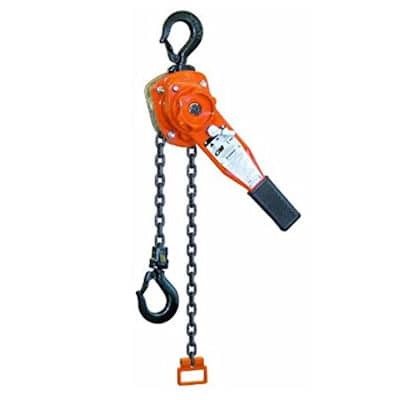 The All Material Handling ML003-10 Mini Lever Chain Hoist is another solid option in the 1/4 ton category. Like the Roughneck and the CM 602, this lever hoist offers a rugged design in a company package. Features include a 10-foot lifting distance, and a planetary gear system that reduces stress on the internal brake mechanism, and at the same time minimizes the effort required to lift the load. And the brake is a self-adjusting pawl and disc design that maintains positive control of the lift load. All of those are indications that the engineers at All Material Handling packed a lot of features into the ML003-10. The ML003-10 weighs in a little heavier than the Roughneck, but also delivers the same 550 pound capacity as the CM 602. And a survey of online reviews shows owners have an overwhelmingly positive experience with this hoist. 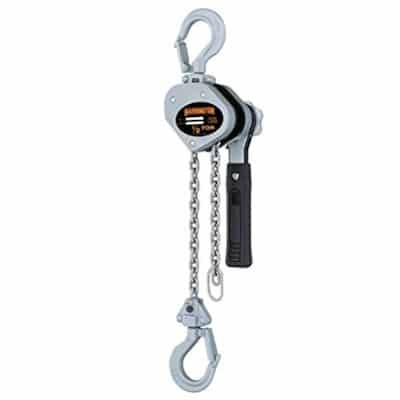 Given the quality design, extra lifting length, and competitive price, the All Material Handling ML003-10 is a great choice if you are looking for compact lever chain hoist. 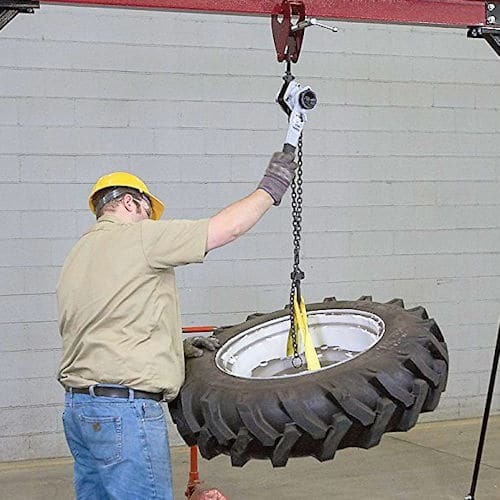 When you your lifting needs run heavier than 500 pounds (the average 8-cylinder engine weighs in at 575 pounds, for example) it is time to look at half-ton lever hoists. The top competitors in this category are still relatively compact, but definitely larger – and heavier – than the mini hoists in the previous group. Our top pick in the 1/2 ton weight class is the Harrington LX005-10 Lever Hoist. This powerful little hoist can raise 1000 pounds of payload a full 10 feet, and only requires a moderate amount of operator effort to do it. The Harrington LX has great durability, thanks to a steel frame and a die-cast aluminum body. An while it is a little larger than the 1/4 ton options, it is still plenty small enough for good mobility and operation in tight work spaces. A survey of reviews of the LX005-10 reveal a lot of happy users. People are using this lever hoist in a variety of applications, including automotive, marine, and even light construction. The consensus is pleasant surprise at how well-made and useful the Harrington LX is. The wealth of features and number of positive reviews made the Harrington LX005-10 our top pick in this category. It is a great little hoist at a good price. 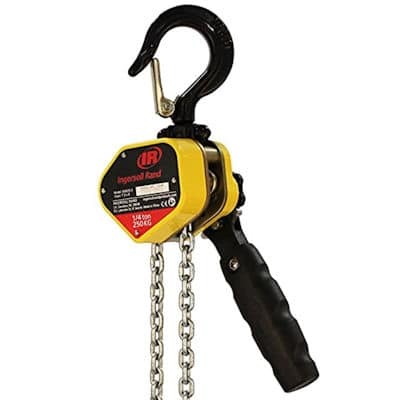 The All Material Handling ML005-10 Mini Lever Chain Hoist is another great entry in the half-ton class. This hoist is very similar to the ML003-10 that took third place in the 1/4 ton category. It features the same planetary gearing system to reduce user effort and maintains positive load control by way of the same mechanical load brake. But the larger and stronger components in the ML005-10 allow it to lift double the payload as its little brother. The ML005-10 is built to be durable, with a tough chrome exterior finish that resists corrosion. And that durability extends to the load chain, which is constructed using grade 80 zinc-plated alloy. The interior of this lever hoist is tough too, using sleeve bearings to maximize lift serviceability while providing good efficiency of operation. It is these quality touches, in conjunction with competitive pricing, that make the ML005-10 our #2 pick. The Ingersoll Rand KX050-10 Kinetic Sidekick is another solid entry in the half-ton category. One look at this multi-function lift and you will see that it isn’t just a light-weight consumer lift. The KX050-10 is definitely professional grade, meaning that it is more than tough enough for your home/garage/boating/hunting applications. This quality lever hoist will stand up to the rigorous demands of commercial and job site applications. At less than 10″ x 10″ in size and just over 7 pounds in weight this Ingersoll Rand lift is compact enough to operate well in tight spaces. But don’t let the smaller size fool you – its steel side plates are heat treated for durability, and the load chain is either zinc or electro-plated to resist corrosion, so this is one tough hoist. And like many other competitors in this lever chain hoist review roundup, the KX050-10 comes with a heavy duty carrying bag, making it easy to store and transport. So if you need a compact hoist that is a step above the lighter duty entry-level options, the Ingersoll Rand KX050-10 might be just what you are looking for. The CM Series 653 Lever Hoist is our #1 choice in this category for several reasons. The first is CM’s ability to deliver 1500 pounds of lift while keeping the overall hoist size small. The 653 manages to give 8 feet of lift while only requiring a little over 12 inches of headroom and utilizing an 11 inch lever, and yet somehow only requires 33 pounds of force to raise the payload. That is a lot of mechanical advantage in a small package. The other amenities of the CM Series 653 also impressed us – the 360 degree rotation of the lever, the stamped steel frame that is both impact resistant and light weight, and the roller chain guide that helps prevent jamming. The Weston braking system is also a nice feature. Taken as a whole these features convey quality and attention to detail by the manufacturer. The online reviews for the 653 echo those sentiments, with reviewer after reviewer mentioning the high quality of the unit, and describing it as a great little hoist at a decent price. We concur, which is why we made the CM Series 653 our top pick. Efficient handle rotates 360 degrees, minimal maintenance with no special tools required. The Harrington LB Series 3/4 Ton Steel Lever Hoist is definitely a step up into professional grade. All of the Harrington LB’s are decent, and some of the lighter weight models made our review roundup. But the 3/4 ton LB takes it to the next level. This powerful lever hoist can pull 1500 pounds of load a full 15 feet, and only requires 11 inches of headroom and less than 10″ of lever to do it. It is built with tough all-steel construction that somehow weighs less than lifts from other brands that are made from aluminum. Pro-level components include heat-treated and machined split load double reduction gears, a Weston-style brake with two moisture-resistant brake pads, and LB’s patented freewheel mechanism. It is spring-loaded to give the user easy load chain adjustment while preventing accidental freewheeling while under load. All these elements add up to a professional grade lever hoist in the Harrington LB. Online reviews of this hoist come from both laymen and commercial users, and they attest to the unit’s quality and usefulness. So if you are looking for a reasonably priced, high-quality 3/4 ton lever hoist that will last, the Harrington LB Series should be on your short list. Vestil makes their first appearance in our roundup of top lever hoists with the Vestil PLH Lever Hoist. Its 10-foot hoist distance is shorter than the Harrington LB, but its 11 inch headroom and 11 inch lever make it a strong contender in a small package. The Vestil PLH features an enclosed friction disk brake that makes for increased wear resistance. It comes with a grade-100 alloy steel load chain that offers strength while at the same time minimizing weight. The mounting hook is drop forged for strength, and the load hook will swivel through a full 360 degrees, making it easier to handle whatever load you choose to lift. Another nice touch on the PLH is a free wheel chain that allows the operator to easily reduce chain clack when it is positioned in neutral. These features demonstrate the Vestil designers were thinking of the people who would be using this lever hoist when they created the PLH. Online reviews of the Vestil PLH mention things like good quality, ease of use, reasonable price, and suitability to task – basically everything you want in a lever hoist. One reviewer even commented on the quality of the carrying case, which is a step up from other manufacturers that throw in a cheap bag as almost an afterthought. All of these aspects of the Vestil PLH Lever Hoist add up to a quality hoist at a great price. When you need to lift 2000 pounds or more, you step up to professional grade lever hoists. Features like all steel construction, hoist overload protection, and ratchet lever length come into play as load capacities increase. There are a number of different options from a variety of manufacturers in the 1 ton capacity and greater category, and we are still reviewing the different models and product details before we make our picks. But check back soon to see the best lever chain hoists for 1-ton and greater loads. Lever hoists are ingenious mechanical devices that allow you to raise, lower, and move heavy payloads with a relatively small application of force. 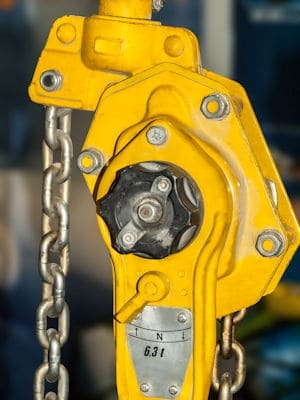 The gear mechanism inside a ratchet lever hoist transfers hand force you apply to a lever, concentrating and focusing it into a force strong enough to lift an attached load. The chain lever hoist mechanism is relatively simple – it is made up of a ratcheting lever attached to a large wheel, a gear set on a drive shaft, and a lifting hook attached to a load chain threaded on a sprocket wheel. The ratchet spins the drive shaft, which in turn engages the gears. The connected gear sets interact to turn the sprocket wheel. The teeth on the wheel move the load chain, pulling the hook to lift the load. Many also employ a Weston-style brake system, to hold suspended loads and keep them from slipping.